Just a few miles south of downtown Cleveland in Independence, Ohio, lies one of the stars of theline up of fine eateries, Delmonico’s Steakhouse. This well-rounded steakhouse offers a perfect combination of prime steaks, fresh seafood and a well-rounded list of sides, salads, desserts and appetizers all served in a luxurious well-appointed dining room. 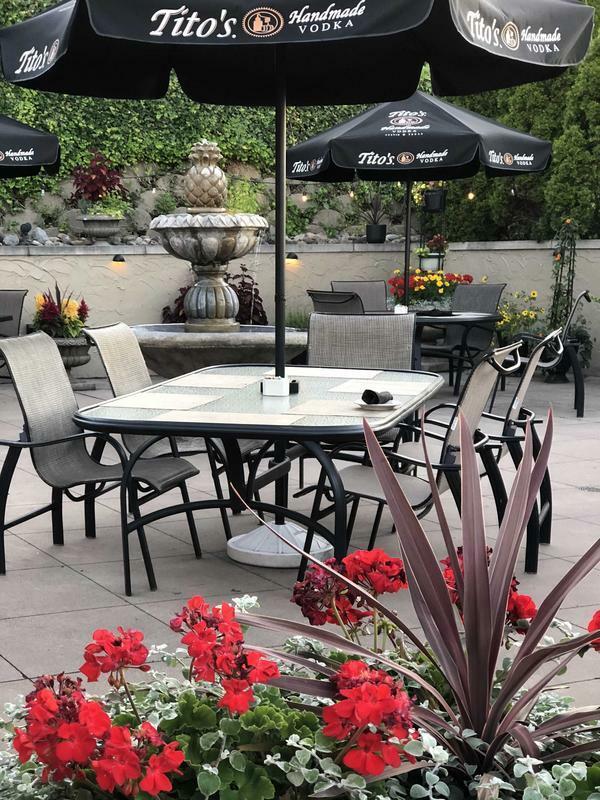 If the weather is cooperating, their comfy outdoor patio also makes for a very enjoyable evening. I’ve had the pleasure of dining here many times and have always enjoyed exceptional service and food prepared exactly as ordered. Their daily specials are usually exceptional and unique dishes created by the Delmonico’s team and a great extension of their regular menu. A perfect starter to any meal at Delmonico’s is the Blackened Scallops. 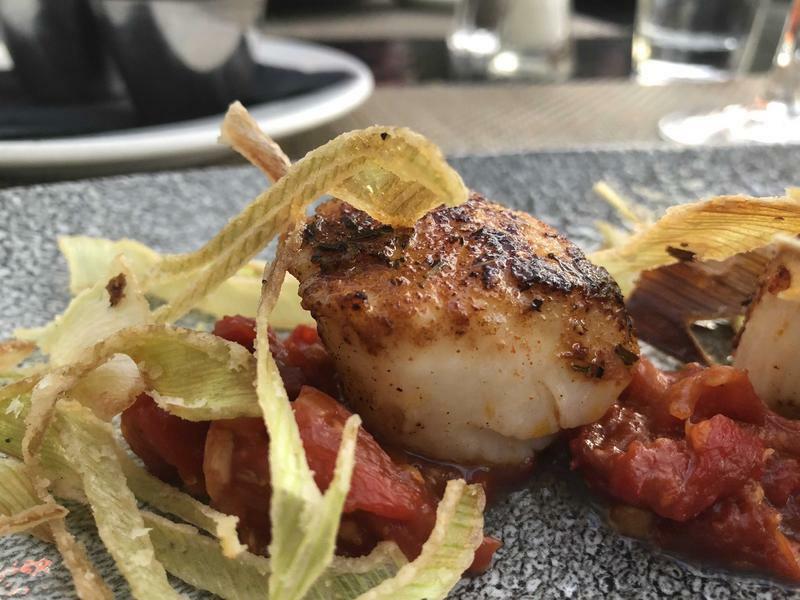 Roasted peppers, tomato chutney and fried leeks complement the delectable fresh scallops. There are three on the plate, which makes it just the right amount for two to share and not fill either of you up too much before dinner. The scallops were (as always) very tender and cooked to perfection! 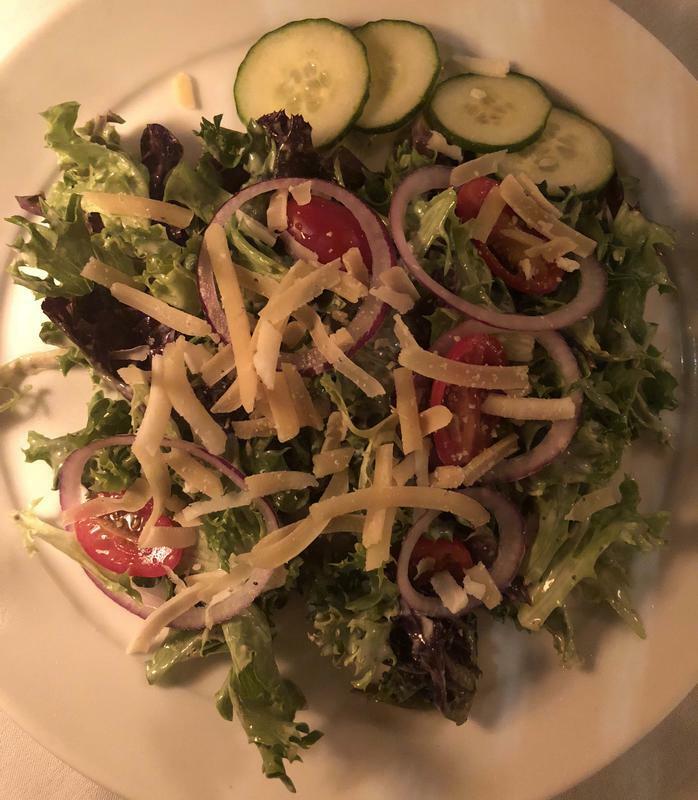 Delmonico’s regularly offers exceptional daily salad specials and they’re always good bet to be fabulous. However, on this particular visit, my partner and I broke tradition and indulged in the Delmonico’s Salad. Consisting of onion, tomato, cucumber, Parmesan cheeses topped with a special Tuscan herb dressing this salad was a welcome plate of cool freshness at the end of a very warm day. For entrees, we went two different directions. My partner tried the Crab Crusted Gulf of Maine Salmon and I ordered the long time favorite, brought in from the Cabin Club on Cleveland’s west side, Steak Christopher. The salmon was prepared with goat cheese, polenta, sun dried tomatoes, gremolata and pistou. The salmon was wild caught which is much preferred over farm raised and was cooked to perfection. 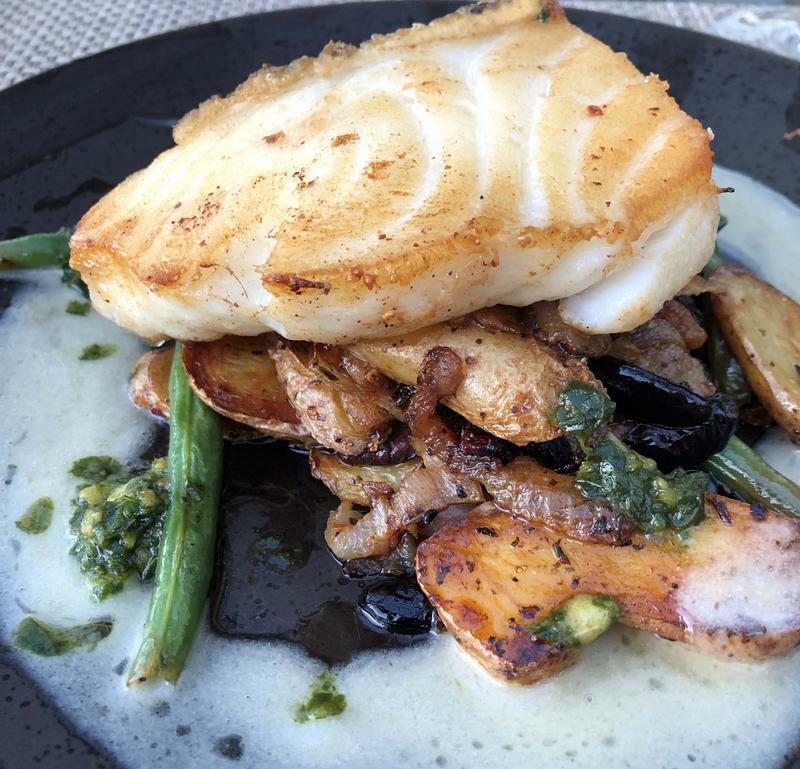 The many flavors and textures on the plate came together for a spectacular surprise as my partner raved about it long after the plate had been removed from the table. My Steak Christopher consisted of two beef filet medallions atop garlic mashers and included asparagus, shrimp and béarnaise sauce. 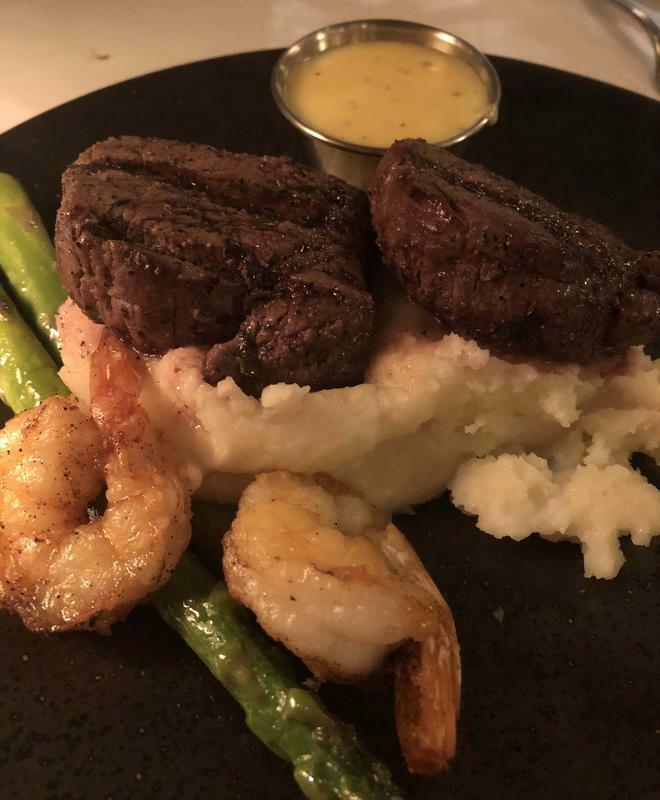 The filets were cooked perfectly as was the asparagus and shrimp. The béarnaise sauce complimented all perfectly and the flavors came together for a perfect meal. We finished the meal with local favorite, Mitchell’s Ice Cream. 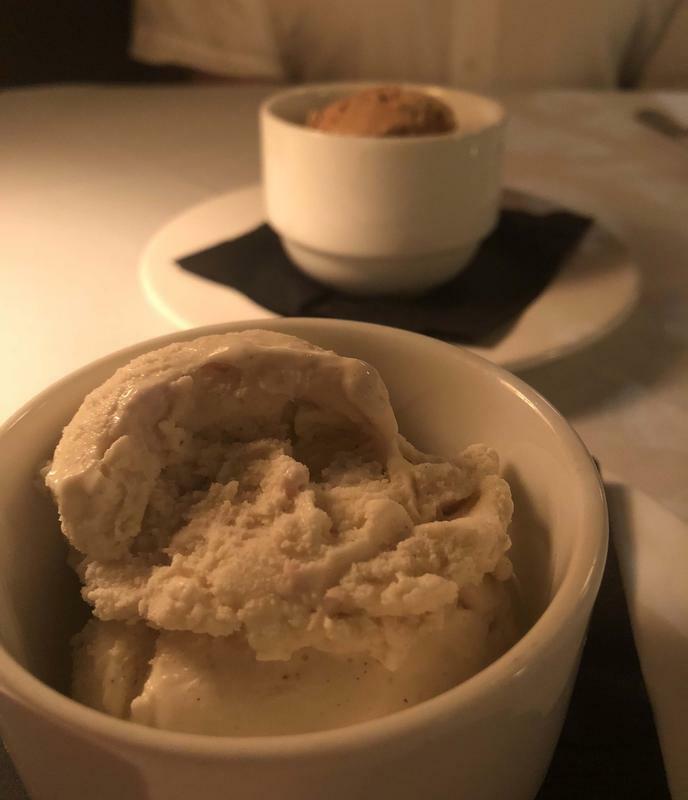 The scoops of vanilla bean and sea salt caramel ice cream were just the right size and sent us home smiling. Click Here to View the Delmonico's Steakhouse Menu! No matter what you order on the extensive menu, Delmonico’s restaurant in Cleveland is a sure bet! I’ve eaten here for years and never even had an average meal and I’ve never been disappointed with the service. Whether dining at the bar, indoors or outdoors. It’s a perfect stop for any occasion…or no occasion at all! Click Here to Make Reservations at Delmonico's Steakhouse Cleveland Oh! Mr. Rock and Roll: Meet Cleveland DJ Alan Freed!